Important Note: Brand new item as received from Antares. The 1.25" eyepiece holder seems to be just slightly undersized. It worked with all six 1.25" barrels we tested it with. Most went in easily and smoothly as they should. However, a couple needed a bit of coaxing and care to insert, but again, they all worked. Closeout, so all sales are final. Antares' 1.25" Extension Tube # ET1 adds 56.5mm (2.22") of back-focus travel to your telescope focuser. It fits standard 1.25" eyepiece tubes in telescopes and accessories like diagonals. 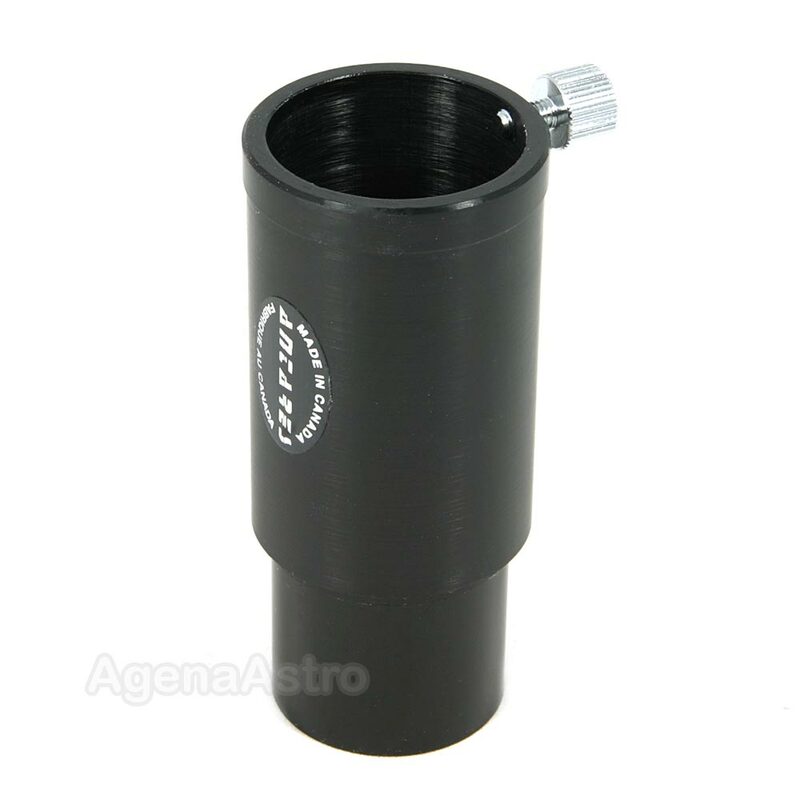 With this, eyepieces and accessories that you may not have been able to use because your focuser tube was too short are usable again The adapter is precision machined from aluminum and black anodized, and threaded to accept standard 1.25" astronomy filters. Note that Antares uses a fat thumbscrew on this item at the top, and this extends a bit above the top of adapter. So if you have a very wide eyepiece or accessory, the screw may get in the way and prevent the inserted item from going in all the way into the adapter. Typical Antares production quality - works well but a bit rough in finish. This extension tube is exactly what I needed and the quality is excellent and Agena Astro Products service was excellent as well. Great products at reasonable prices. Review by Don K. of Vista, CA. I own a short focus Newtonian (f4) and even with a 2x Barlow higher magnifications are hard to achieve. By placing an eyepiece into this extension first and then placing the entire combination into the Barlow, it gives me approximately 2.8x magnification. My favorite 17mm eyepiece now gives me 74x which in my scope is in a sweet spot for most of my observing needs. My 10mm now gives 126x which is good for a lot of closer doubles, the Moon, and the planets. It does result in the eyepiece sticking out further from the focuser, but I don't care. For me this is the best accessory I've ever purchased and has made my scope more versatile. 5.0 Antares Extension Tube - 1.25"
Does the job at a great price!! Nothing bad to mention about the extension!! This extension is just what you need for the extra focus travel!! Unless you want to hold the eyepiece out of the focuser :-) Works with any telescope, but is a must for reflectors at close range! !